Record Store Day is coming up on April 18, and I was reading a list of artists who are contributing, and saw Blitzen Trapper listed as having a 7" out that day, but no other information. Matt, can you confirm/deny, and give us some details? Thanks! Yo, the 7" is a couple of older recordings, both rad songs: War is Placebo b/w Booksmart Baby. The A side was part of the abortive Waking Bullets record, B side was recorded as part of something Earley ended up calling "Wooden Dress and Dresser Set", the same source as Going Down and Shoulder Full of You off the tour EP. Awesome, I always knew the song as War, and you are right Marty, it is rad. Looking forward to Booksmart Baby, wondering if I have that tucked away somewhere. Thanks for consistently putting out new material, building up quite a discography in a short time! Truly a thing of great beauty. Sub Pop did a great job on these. Also, they come with download vouchers for both of the tracks. Ahh! We're gonna need some of those at the CD/Game Exchange in Eugene, Oregon! thats the prettiest record i have ever seen. hope the songs are good as well! I had not heard of the band before, but liked the name. In the spirit of Record Store Day, I took a chance and boy did it pay off. Not only is it a beautifully looking record, I love the music as well. The free digital download voucher is a great bonus. Way to go BT and Subpop! Picked this up yesterday, and it has without a doubt the two best songs I grabbed that day. I love this band. Both songs are absolutely brilliant. Is it too early to request their inclusion in the Pitchfork fest setlist? I was really thrilled to find this at Reckless on Saturday, they were sold out at the other place I went to! Looks great, sounds great, proud to own it. Thanks BT! Yup, nabbed this at Easy Street on Saturday, apparently Sonic Boom sold out pretty quickly. LOVE it. How amazing is the color on that baby? The songs, obviously, are ace. Is there any way we could get the lyrics for these tunes? I couldn't find them anywhere on the internets. dvp - you don't shop at House of Records in Eugene? It's an old house they turned into a record store, each room has different stuff in it. It's pretty cool. I drive down from Albany every now and then. I've come across some sweet finds there. Bootleggs, hard to find stuff in general, some very nice older original vinyl, I always find more stuff than I have money for. Has anyone seen copies of these "Record Store Day" albums still in record stores at all? On April 18th I BARELY remembered it was happening until like the last second. Only thing I was able to score was MMJ's "CelebraciÃ³n De La Ciudad Natal"
I'm sure I could hit up eBay, but j/w if it would be as easy as popping into some store downtown and checking it out. hey all, it is my first time so be gentle. just wanted to let you all know we have the record store day 7inch for sale at our merch table on this tour and while supplies last. so, come on out to a show and pick one up! Junglelove: this is basically Waking Bullets released at last. It's awesome, grab one while you can! I'm going to be out of country for RSD and I'm trying desperately to figure out what to do! Waking Bullets At Breakneck Speed is the first volume of Blitzen Trapper's Unreleased Recordings Series. It was recorded at the Telegraph Building in Portland, OR during the Wild Mountain Nation and Furr sessions circa 2006. I definitely remember these from back when we were were working on the following up to Field Rexx, as discussed on the thread junglelove linked to. Excited to see them finally out in the world! Snagged a copy of Waking Bullets toady. Really great stuff! Can't believe it's been eight years since I made this post! I love the fact that the band makes a commitment to have some sort of release each year, and I'm very intrigued and excited about this new Unreleased Recordings series! Was up at Reckless Records in Chicago today, and luckily was able to snag a copy of Waking Bullets At Breakneck Speed. Was kind of banking on a download code inside, since I don't have a functioning record player at the moment, but it was not there. :( Oh well, it will be the first thing played on my new turntable! I share your disappointment- RSD is in effect vinyl day. I look forward to the RST day release coming out on a format appropriate for 2017. Anyone know if this release (Waking Bullets) is available anywhere in digital format? At least to stream? Thx. Another year, another Record Store Day is upon us! Any info on this years release? I saw a rumor of a 10” release called Kids Album!, can anyone shed some light? 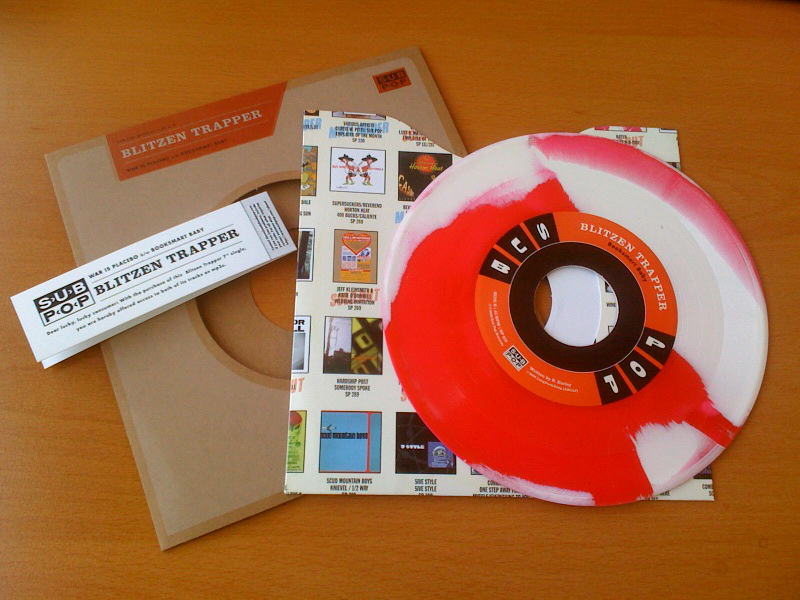 "a Blitzen Trapper record created with toy instruments actually called Kids Album!" Recorded in Portland at the Lavender Compound in 2004 using castoff Casio keyboards and various kid's musical gear, Blitzen Trapper created this collection of quirky off-kilter kid's tunes, the subject matter ranging from bike riding, to a kid who has trouble spelling, to that special feeling you get when your folks have gotten you a new pair of shoes!